The genius is in their simplicity. 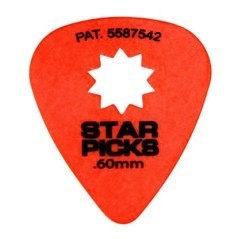 We took a standard 351 shape guitar pick, cut out a Star shape in the middle, registered the patent and have been changing the lives of guitar players one pick at a time ever since. Star Picks are available in all the most popular gauges from paper thin to hard as nails. Since there are no major modifications to the standard shape, the picks feel as familiar as the old standby. Never drop your picks again. It's just plain embarrassing.